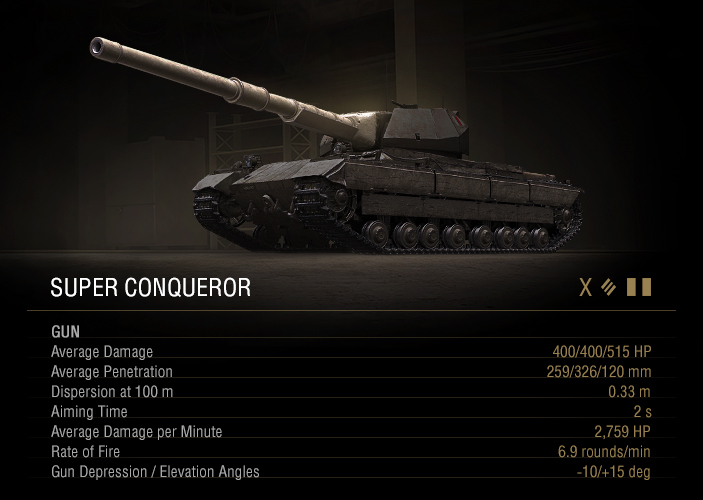 There was a little dust up across the forums during Common Tests as many of you came forward arguing that the Super Conqueror wasn’t Tier X material. Designed as a natural step-up from the Conqueror, the new Brit performed well, but failed to impress, especially in comparison to the FV215b, known for its great firepower. Reports of the Super Conqueror’s fairly moderate durability only fueled the discussion. Although the newcomer had solid protection for an assault heavy tank (comparable to that of the American T110E5), it proved not enough to survive a battle, seriously undermining its performance in an assault role. In response to your feedback, we revised the Super Conqueror’s gun parameters and durability. Its reload speed increased and so did its damage per minute. Now, you can send more shells the enemy’s way, dealing greater damage. To gear it up for a more active role, we also improved its gun stabilization, raising your chances at landing a precise shot on the move or right after you stop. 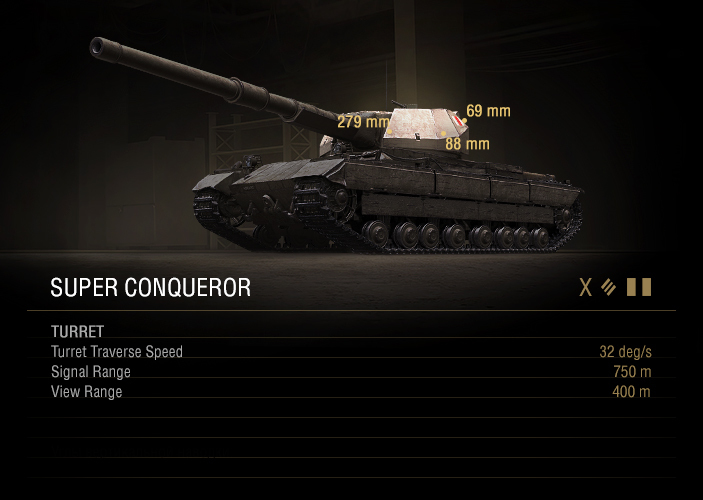 Durability should go up, too, as the Super Conqueror gets a larger HP pool (now comparable to the FV215b, bearing in mind the Super Conqueror’s armor, of course) and improved gun depression (now set at -10°). You’ll find it easier to go hull down, poking over ridges or hills to hide your vulnerable lower front plate, get a shot off, and then pop back into cover so that enemies have a hard time hitting your weak spots. 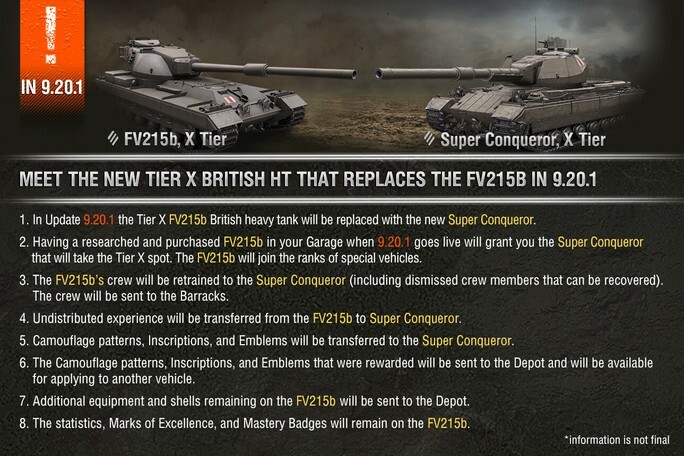 The British heavy line is in for a few changes with 9.20.1, the most significant at Tier X. The FV215b moves out of the way to clear some room for the Super Conqueror, which builds on the skills developed from the line’s Tier VII–IX heavies with powerful, accurate guns and decent protection. This newcomer excels at assault roles, and feels at ease in close-range combat. Let’s see if it cuts the mustard! Update 9.20.1 reshapes higher-tier British heavy tanks into multipurpose vehicles built around the Conqueror’s play style. Unlike lower-tier tanks, the FV215b, with its rear-mounted turret, doesn’t fit this concept. To ensure the line offers unique, distinct gameplay all the way to Tier X, we made the FV215b into a special vehicle and added a tank that feels like a natural step-up from the Conqueror. 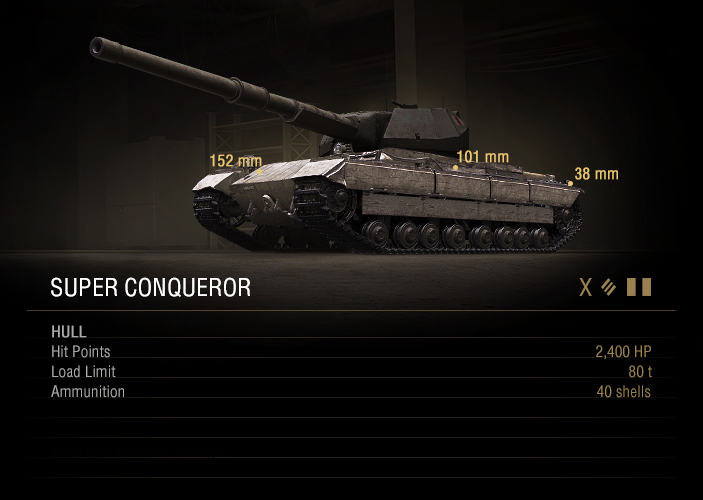 Firepower: The Super Conqueror inherits the 120-mm gun from the FV215b. It doesn’t fall short in any place except DPM, which was reduced to balance out its improved durability. Though it doesn’t boast huge DPM, the gun handles nicely and keeps sending precise rounds the enemy’s way at mid to far distance thanks to excellent accuracy. The high rate of fire means you'll usually be able to fire twice for every time the enemy gets in a shot. And unlike the FV215b, the Super Conqueror doesn’t suffer from a rear-mounted gun, which brings down the risk of taking a few shells to the hull before being able to bring your gun to bear on a potential target. Protection: The turret protection is a great improvement over the FV215b, and its upper front plate is spaced armor, stopping HEAT ammo from penetrating easily—just like the tracks and side skirts covering its side armor. Though the turret's front is very strong, the lower front plate is a major weak spot, and it doesn’t take much for the enemy to find it. Mobility: Remember that you are in a heavy tank, so don’t expect it to bounce around the map. However, the picture isn’t all bleak—its top speed is nothing special, but it keeps up well and accelerates fast, for a heavy tank. And it’s enough to close in on an enemy and show them who’s boss. 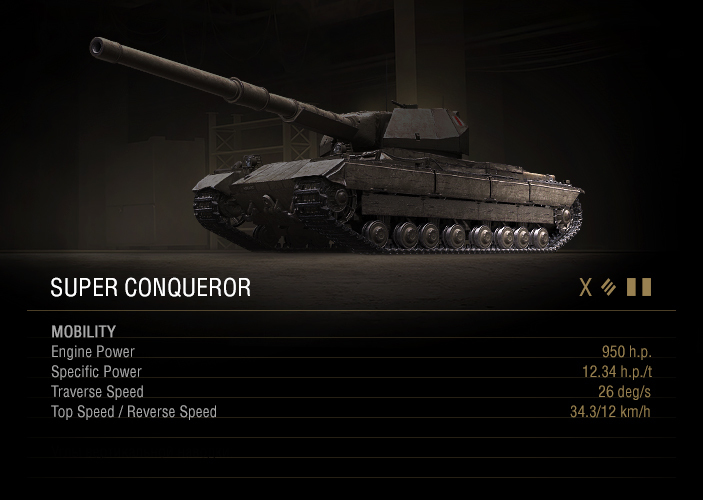 Leverage your DPM: Though the Super Conqueror has moderate alpha for a Tier X, it compensates with an impressive rate of fire. Pump the enemy full of your 400-damage shells, robbing them of 800 HP for every shot fired. Angle or they’ll pen you: Tier IX and X enemies will have no problems slicing through the large lower front plate. Try to hide it in any way possible. Work your side armor: The sides are covered completely by tracks and side skirts, giving you two layers of spaced armor. That's enough to mitigate most of the HEAT damage. Don’t be a second liner: The Super Conqueror now has enough armor to get an upper hand in a one-on-one fight. 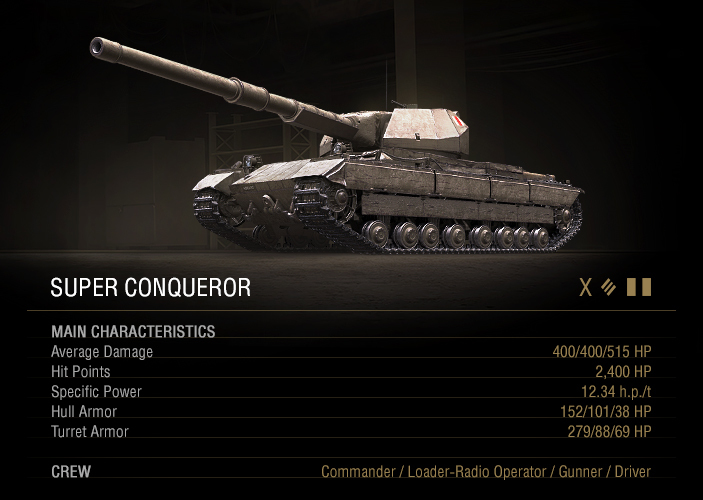 The core concept of a thick-skinned, hard-hitting tank makes the Super Conqueror a versatile heavy that can carry a team. It snipes well, brawls decently, and can jump in a 1v1 fight and come out on top—if you play to its strengths. Its DPM is far from best-in-class, but if you make your shots count, this shouldn’t really be a drawback. Hefty armor paired with a fast-firing, accurate gun let you make your presence known on any map.